Super-Vent 8" Inch dia. 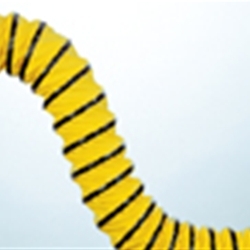 25 ft.
"Single-ply neoprene impregnated yellow polyester fabric hose construction with an external wearstrip reinforced with a spring steel wire helix. Ideal for moving large volumes of air in portable or permanent verntilation/exhaust systems. Wearstrip offers external abrasion resistance. Highly compressible. Retractability allows for convenient storage and easy transport in a fraction of its fully extended length. Low friction loss.